What Does a Tribal Liaison Do in Region 7? The relationship between a federal employee and a Tribal representative is based on the same tenets as any other: respect, trust, and lots of honest communication. A large collection of history, policy, and case law defines the relationship between the federal government and Tribal governments. Because each Tribe’s interests and concerns are unique, I have no typical days – and that’s one of my favorite things about my job. Since November 2014, I’ve been serving in a temporary position filling a vacancy in our Region 7 Office of Tribal Affairs. As part of these duties, I serve as a liaison between EPA and five of the nine Tribal nations in our Region. I also negotiate and manage several financial agreements with our Tribal partners. To an outsider looking in, my day may look calm, spent sitting in a meeting room or in front of a computer. Behind the scenes, most of my day as a liaison is spent translating. I translate the opportunities, needs, and requirements of the federal government into actionable goals and tasks for the Tribes to consider. Likewise, I work to understand and translate the needs and priorities of the Tribes to create better opportunities and policies at EPA. Outside of my Agency work, I do not have a background or experience with Tribal governments or cultures. I grew up an Iowa farm girl in an agricultural community inherently skeptical of the federal government. Neighbors may disagree with one another but are quick to unite to improve their community’s resilience. At home, handshakes are binding agreements and individuals are judged by their honesty and ability to follow through on their commitments. Growing up in an agricultural community has been excellent training for my experiences in our Office of Tribal Affairs. In many ways, working with the Tribes feels like home. In my role as a Tribal liaison, it’s important to recognize the cultural and economic influences in scientific conversations and to share those insights as EPA discusses new policies and programs. I have about two months left in my temporary assignment. In those remaining days, my desire is to do the right thing – one day at a time. This month, Region 7 will be doing a lot of what this agency does best: listen, learn, and lead. The reason: the President has tasked the EPA to take the point on one of the most important challenges facing our generation of Americans: cutting carbon pollution that harms our health, impedes our industrial competitiveness, and poses serious challenges to Heartland communities that depend on agriculture. The President in June announced a national Climate Action Plan. The President’s Plan assigns EPA a big job in accomplishing these vital goals: cutting carbon pollution from power plants, building a transportation sector for the 21st century, encouraging use of cleaner and avoidance of dirtier energy, and preparing this country for climate change’s impacts on weather and water. Here in the Heartland, the U.S. Environmental Protection Agency cares about fairs. All kinds of fairs: local, county, and the “big ones” for our four states. In a region that provides a huge share of the nation’s and the world’s food, forage, fiber, and fuel, these annual gatherings in late summer and early fall give ag producers and their families a great chance to show off their work and to educate their city cousins about the realities of growing food. Since I became the Regional Administrator for EPA’s Region 7 office, I have attended the Iowa, Kansas, and Missouri State Fairs. I spent a great day in Des Moines last month at “the fair with which none can compare,” the Iowa State Fair. Hope the attached pictures show how much fun I had, and also how much new EPA Administrator Gina McCarthy valued her day at the Fair. Well, it’s getting close to that special season again; when our view of the world around us goes from sepia to brilliant color and little flowers sing a welcome to us when we step out the door. Oh, wait, either I’m having those annoying delusions again or I’m confusing real life with a certain movie. Either way, I’m pretty happy that when twister season begins we can see it happen in all its powerful glory. You may think I’m crazy (having delusions was kind of a hint), but I love to watch storms and particularly ones that portend a tornado. Our tornado drill earlier this week also brought this to mind, although it was a bit strange to look out the window at fields of snow as sirens blared. Oh, don’t get me wrong. I may be crazy, but I’m not stupid. When the sirens beckon, I reluctantly take my snarling cat and my purring husband down to our safe place in the basement. Maybe I got that last sentence backward, but you get my drift. But before I head downstairs, I love to sit on the back porch and watch the sky. The towering cotton balls of cloud standing in bas relief against a deep grey sky signal the beginning. As the sky darkens, I’m always transfixed by how many shades of purple-slate nature’s ceiling can take on. The best of all is when everything turns that bilious yellow-green like a dragon about to heave his last meal. It’s scary and wondrous all at the same time. And I watch with utter fascination as a line across the sky sends tendrils of cloud downward toward the earth. I watch the bottom line of those clouds carefully and patiently to see which of those tiny tendrils might descend and grow, heralding the beginning of another anxious season. I always feel a thrill when before my very eyes I witness the birth and death of a tornado as a tendril forms, descends, then is sucked back into its mother-cloud. What makes twister season so enthralling to me is the overwhelming power of it all. The simple fact that a cool breeze becomes a strong wind then becomes a force of such great destruction that it flattens whole towns. I’m always gob-smacked by that feeling of breathlessness when suddenly the wind stops dead; the air becoming thick and heavy. The humbling effect of clouds that are so very beautiful to behold can become so alarmingly black that street lights come on in a display of confusion. How a lovely sunny day turns into an angry hissing mess that makes adults run to hide like little children. We are forced to take cover, and yet, there is a longing deep in my heart to watch it all play out. My husband thinks I should have chosen meteorology as my career path. I have no desire to stand in a TV studio blathering on about the weather-I want to watch as it unfolds. If I had to watch a screen I probably would watch the beautiful site Casey shared last year, where you can literally watch the wind from your computer. Don’t even get me started about our booming Kansas summer thunderstorms. I get up in the middle of the night to traipse out to the back porch and just sit in amazement at the show. It helps that Mother Nature hasn’t included any obnoxious commercials with this fabulous production. So, my friends come join me sometime while I watch and listen to one of the most amazing and terrifying events that our atmosphere has to offer. I’ll put on a pot of coffee and you bring the cookies. To really appreciate what’s happening you have to be willing to sit patiently for a while. There’s plenty of room on my back porch and I’d welcome your observations in the “Merry Old Land of Oz”, home to over 3,700 tornados. Cynthia Cassel is a SEE Grantee where, for 3-1/2 years, she has worked with the Wetland and Streams team in the Water branch. Cynthia received her BS from Park University and lives in Overland Park where she regularly carries a bag of rocks so as to remain safely earthbound. I was born in the great state of Kansas and I will most likely die here too. While there are some good things to say about Kansas, what I say next may be shocking to you. I love and hate this place simultaneously. Whether you are cold-natured or one of those folks who walk around in shorts and flip-flops all winter long, there is no getting around the single most uncomfortable and annoying aspect of this state; the never-ending, never even waning…wind. You can bundle against the cold, you can strip like Gypsy Rose Lee when it’s summertime but you can never ever, ever get relief from this gawd-awful wind. Chicago is nicknamed ‘The Windy City’ but that’s really a misnomer. Chicago got that bad rep due to an editorial in the New York Sun in the 1800’s referencing the hyper-loquacious nature of Chicago politicians. Since the nickname could be applied to every U.S. city, this must be the windiest planet in the galaxy–but I digress. In a recent Kansas City Star article about the Flat Ridge Wind Farm being built in southern Kansas, John Graham, CEO of BP Wind Energy said, “Kansas is blessed with very strong winds.” I don’t think the words blessed and strong winds belong in the same understatement, but that’s just my opinion. The other downside is that I keep getting accused of having bad posture. It’s not bad posture that makes me walk like Grouch Marx. I’m a small-ish person – it’s the only way I can keep from being blown over backward. But back to the wind farms. Whether you are a proponent of wind energy (in other words, you’ve got a big gob of land you’d like to lease for a tidy profit), or a proponent of a form of energy that doesn’t thwack pretty songbirds into a stupor, you’ve got to admit Kansas will suffice as a good source of wind. Less dependence on middle eastern oil is the upside and the 274 wind turbines at Flat Ridge-2 can supply 1,600 homes with electricity. Another plus is that projects like Flat Ridge and Flat Ridge-2 bring dollars into the state. And even a curmudgeon like me has to admit that hundreds of snow white turbines all spinning at once looks like a lovely in-place ballet. Yeah, that’s what I’m talkin’ about! Find a way to make those turbines catch that wind, channel it into a great big funnel and use it for yet another positive purpose. It wouldn’t be able to blow all of our lovely Kansas soil from here to New York and I could finally walk like a normal human being. Our region struck out during bowl season this year but we can still look at some great sources for GIS data! We started by sharing some of the great sources available from Nebraska; today I turn to our host state of Kansas (for those keeping track, Kansas State lost to Oregon). I should probably remind readers that I am an alumnus of the University of Kansas (I’m glad for college basketball season — ROCK CHALK) which is also home to several state level geo-related entities. The primary repository for Kansas’ GeoData is the Kansas Data Access Support Center (DASC). If you’re looking for Kansas data, , KansasGIS.org is the place to go with everything from LiDAR to Cell Towers to Aerial Imagery to Geology to Water to Wells. Most state offices who create GIS data, like the Office of Water, warehouse their data and metadata with DASC. 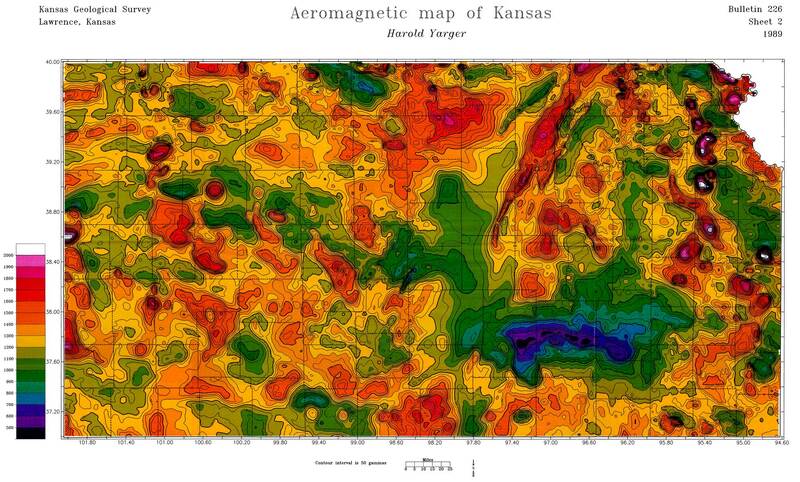 Aeromagnetic map of Kansas by Yarger, H.L., 1989: Kansas Geological Survey, Bulletin 226, sheet 2. Next up is KansasView, “a consortium of universities and federal, state and local government working cooperatively to advance the use of remote sensing and GIS technologies in the State of Kansas for education and research and to assist government agencies apply these technologies.” KansasView provides data and information about the Kansas landscape using remote sensed data. The Kansas Biological Survey (KBS), one building south of DASC and KGS, focuses on holistic environmental analysis. KBS hosts maps and webservices. I would highlight the reservoirs datasets that KBS has compiled; each reservoir is listed and most have readily available data and maps of bathymetry – that way you can find the best fishing spots or know the answer when someone asks, “How deep do you think this is?” The GreenReport map depicts “greenness” over the entire county (REST service available). I’ve heard several stories in the last week about winter wheat conditions in Kansas (specifically) and about potential flooding or drought activities in the spring and summer and this will be one way of monitoring conditions. The Agency relies on state collected data and Kansas collects, maintains, and distributes a lot of great data. I know there is much more available; what is on your wish list of Kansas data?